In the U.S., most of us can read. But still very little is known about how our brains actually do it. Up next — a scientist who studies what’s going on in our brains when we read. Dr. Guinevere Eden is Director of Georgetown University’s Center for the Study of Learning. She’s in the third year of a five-year study that’s looking at what parts of the brain we use to read. Guinevere Eden: Unlike the rest of the brain that sometimes has evolved to be very good at different types of tasks, reading is something that we’re not born to do, it’s something that we teach our brain. So we want to know, where in the brain does reading happen. “Woman Reading,” Pierre Auguste Renoir. To find out, Eden and her colleagues use “fMRI” — or functional magnetic resonance imaging. It uses a kind of giant magnet that can detect which areas of the brain are working harder. Volunteers lie inside the magnet reading. Computers translate the magnet’s signal into a visual image. The researchers have found several areas in the brain that consistently light up when we read. Part of Eden’s current research focuses on finding out what those areas of the brain were evolved to do in the first place. Guinevere Eden: Why did these areas get chosen and what is it about there areas that makes them good for the reading process and … why do they consistently get picked? Recent fMRI scans show that people use similar brain areas for reading as they do for processing visual motion — such as identifying the direction of moving dots on a screen. Eden and her colleagues have found several areas in the brain that consistently light up when we read — but not as brightly in people with the reading disorder dyslexia as in brain images from normal readers. We try to understand where in the brain reading occurs. And reading is something that we go to school, we’re explicitly taught how to read, and somewhere in the brain, that process must be taking place. Can you tell me about your current research? 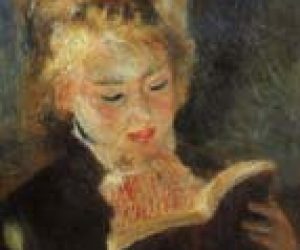 What does “the signature of reading” mean? Unlike the rest of the brain that sometimes has evolved to be very good at different types of tasks, reading is something that we’re not born to do, it’s something that we teach our brain. So we want to know, where in the brain does reading happen. How does a functional MRI work and how does it allow you to find out what parts of our brain we use when we read? One of the other research interests that we have is to not only understand what are the areas we use to read and how do they differ in people with dyslexia, but how did they get roped into the reading process in the first place. Because we have so many areas in the brain that have become evolved for a specific task…through evolution, they’ve made us better at surviving. We have areas in the brain whose only job in life is to tell us when something is moving in our periphery. And the reason we have that is because if we didn’t, we would have been eaten by someone who would have moved in through the periphery and had us for lunch. Those are the very old areas in the brain that we have maintained. But reading has only been around for four thousand years — and has only been actively practiced for maybe a thousand years, not even. So when we teach someone to learn to read, we’re asking them to something that’s not really a very natural task and that we haven’t evolved to do. And so the question is the areas that do get involved in the reading process, what were they designed to do in the first place, and why is it that they got picked to become involved in reading? And how do you answer that question? By asking people to do not only reading tasks, but other tasks that we think may share something with reading, in terms of the mechanisms, even though they may not obviously seem related to reading. One of those tasks actually happens to be perception of moving objects, because we know that people who have dyslexia have very subtle deficits in visual motion discrimination. It’s not clear to us how this relates to their reading deficit, but it may be that areas in the brain that are involved in reading and areas in the brain that are involved in visual motion perception have some property, the neurons may have something special that allows them to become very good at these two different processes. It may have something to do with the timing — we’re not quite sure yet. It’s twofold research. One is to really characterize dyslexia more carefully and then go on to understand which of these behavioral issues that we see in dyslexia are the ones that are most amenable to intervention and would then bring about better reading gains. Imaging can be very good at helping in some of those, but maybe is harder to use imaging for some other aspects, depending on how well these tasks lend themselves to lying on your back, inside a tunnel. as you’re reading these words and being able to do it in the kind of experimental constraints that we sometimes have with brain imaging. How has your research changed since the advent of the fMRI? We can now scan children, which previous imaging methods didn’t allow us to do. And if you want to understand what is the mechanism of dyslexia, you really want to see the brain in young dyslexic children, rather than studying adults, who have already had a lifelong history of reading problems. Why do there areas get chosen and what is it about there areas that makes them good for the reading process and… why do they consistently get picked? One question is…what if you read in French or German or Spanish? I came to America to do a fellowship with the National Institute of Health to learn how to do brain imaging. Because there is no animal model of reading. You know, you can study several disorders by developing animal models, but you cannot teach a rat or a monkey to read. And there’s only really one way to understand the reading human brain and that’s by using a non-invasive imaging technology. What are your research plans for the next few months? We have a lot of projects that are ongoing. We study typical readers. We study adults and children with dyslexia. One of the questions we want to know is, why kind of interventions are effective in changing people’s ability to learn to read. Are they the same for adults as they are for children? Are they the same for every dyslexic? There probably isn’t one approach that works for every individual who has dyslexia. We may have to learn more about subtypes of dyslexia, see if the subtypes have different brain maps that go with them and also that they might then respond slightly differently to different kinds of interventions. I’ll tell you what I think is the best thing that’s come out of this research…I think for children to recognize that the problems they’re having aren’t their fault helps them tremendously…that there are studies going on that are trying to work out more about what’s going on inside their heads so we can come up with better ways of helping them. The fact that there’s an image that shows you that there’s a difference between someone with dyslexia and someone without dyslexia I think has helped people understand that …it’s not about being lazy or having the wrong attitude. It truly is a biological disorder.